The Bakken-Three Forks rig count increased by 2 to 175 rigs running over the past week. The NDIC notes around 192 rigs are active in North Dakota, but around 18 of those are in the process of moving in and rigging up. 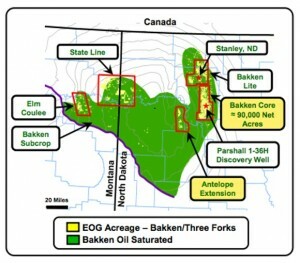 In recent Bakken news, EOG Resources plans on drilling 80-net wells in 2014. That’s nearly double the number of net-wells drilled in 2013, which was 54. At that rate, the company has a drilling inventory in the Bakken of ~8 years. The U.S. rig count decreased by 2 to 1,769 running over the past week. A total of 335 rigs are targeting natural gas (7 less than last week) and 1,430 are targeting oil in the U.S. (5 more than last week). The remainder are drilling service wells (e.g. disposal wells, injection wells, etc.). 176 rigs are running in the Williston Basin across MT, ND, and SD, increasing by two rigs from last week. Note: The NDIC reports 192 rigs are active in North Dakota. That is 17 more than Baker Hughes reports in the Bakken area. The difference is likely accounted for in the number of rigs actually working, rigs that might not be serviced by Baker Hughes AND rigs in areas outside of the Bakken fairway. On any given week, a certain number of rigs are in route to the next well location or idle waiting to drill the next well. The NDIC notes that around 18 rigs are in the process of moving in and rigging up. The number of oil rigs increased by 2 rigs running over the past week. WTI oil prices stayed relatively flat at ~$102/bbl by the end of the week. Williston Basin Sweet crude traded at $79.69/bbl on February 26th. The WTI-Brent remain about the same from last week, settling at ~$6 by the end of the week. The natural gas rig count in the region held flat at zero. Natural gas futures (Henry Hub) were trading around $4.61/mmbtu by the end of the week. A little more than 10% of the production stream from the Bakken and Three Forks is attributable to natural gas and roughly half of that is NGLs. McKenzie County continues to lead development with 56 rigs running. Dunn, Mountrail, and Williams counties are the only other counties with more than 26 rigs running each. View the full list below under the Bakken Drilling by County section.